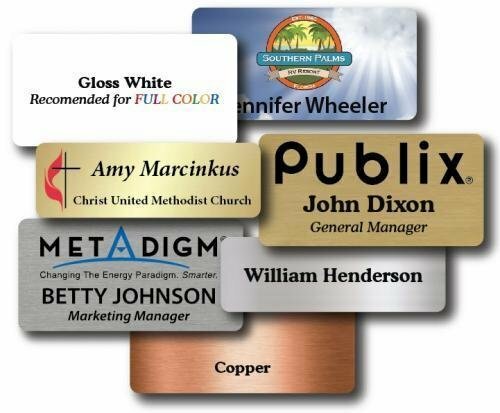 Aluminum name tags are available in: Gold (Shiny or Dull Brushed), Silver (Shiny or Dull Brushed), Brushed Copper & Gloss White. PLEASE NOTE: Images with lighter ink colors will look best on white aluminum. Mid to light colors, will appear slightly muted on silver, gold or copper since the ink is not opaque. Please call us and we will be happy to look at your logo and advise you accordingly.